Women walking back from Kolomna’s churches and monastery. 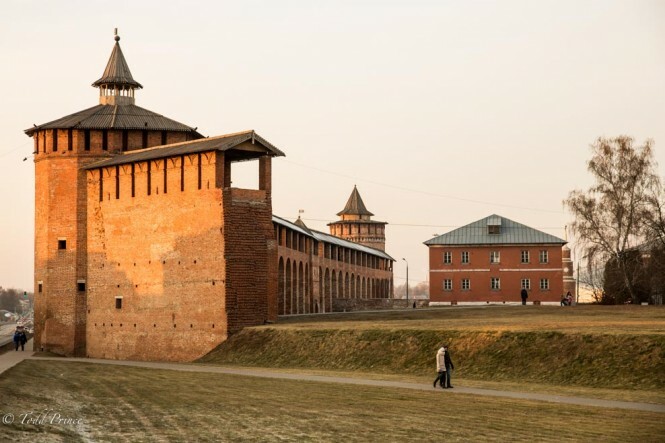 I once whizzed through Kolomna, a small town 120 km from Moscow, on my way to the city of Ryazan and recalled only a Soviet hotel and red Kremlin wall. When I decided to return to Kolomna for a day in late Autumn, I didn’t have high expectations. With many of the small, historical towns around Moscow – the so-called ‘Golden Ring’ towns – you can complete your visit within a few hours. 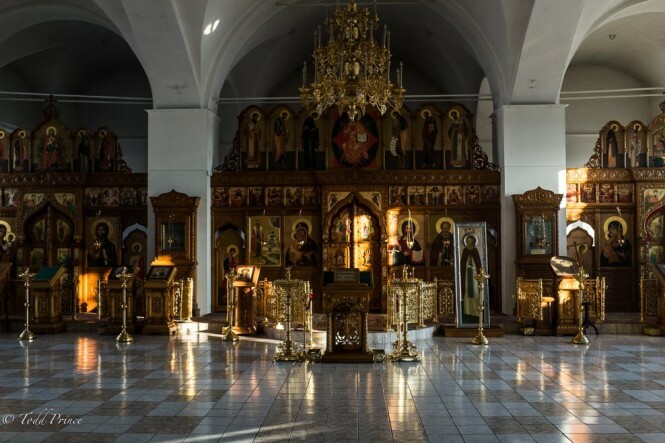 Aside from centuries old churches and monasteries, there often isn’t much else to see or do in these towns while the food and entertainment options are severely limited. I expected the same from Kolomna, which due to being a closed city during Soviet times on account of its military production, wasn’t included in the official list of Golden Ring towns. To my surprise, Kolomna offered a bit more to see than I expected and was in better physical shape that other towns. I took the two hour 20 minute suburban train from Moscow’s Kazansky Train Station, arriving around 11:30 am. I then took the tram from the train station to the Kremlin wall and old town, cutting first through the more Soviet part of the city. The tram ride cost 50 cents. A part of the Kolomna Kremlin wall. Only about a quarter of the two kilometer wall remains. While on the train to Kolomna, I read up on the town. For the history buff, the key highlights relate to wars against the Tatar-Mongols. 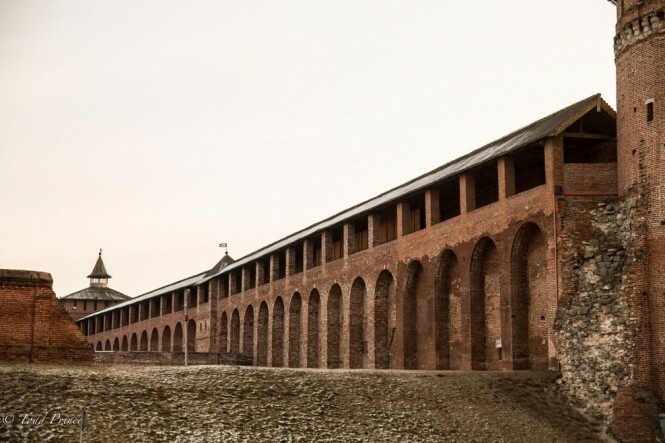 Dmitry Donskoi, the price of Moscow, gathered troops here in 1380 ahead of the Kulikovo battle while Ivan the Terrible did the same before attacking the Tatar stronghold of Kazan in 1552. 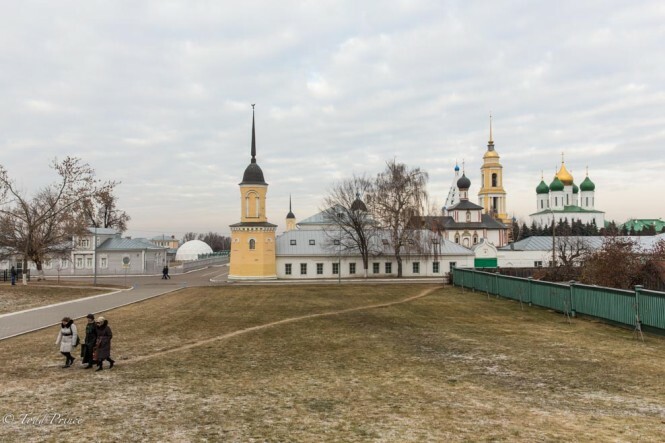 In my view, Kolomna stands out for its compact historical area, its cleanliness and refurbishment. The 2o-meter high red Kremlin wall, which was built from 1526-1531, looks very similar to the one in Moscow. Only about a quarter of the nearly two kilometer wall remains, but several wall towers have survived. Behind the Kremlin wall stand several churches and a monastery around a square in which to take them in. I chose to stroll around the neighborhood and found the homes around the historic part of Kolomna to be in relatively good condition. Some seem to have been renovated or rebuilt not too long ago. A couple biking away from Bobrenev Monastery toward the Kolomna historic district. If you walk about two kilometers east across a river, you come upon the white and blue Bobrenev Monastery. The view of the Monastery from the distance is striking and I would think it would look like a fairy tale in the winter time. There were only a few people at the monastery when I went there, including a priest who offered a tour. I walked around the monastery for about 15 minutes. There is a village alongside the monastery that would be interesting to stroll around. 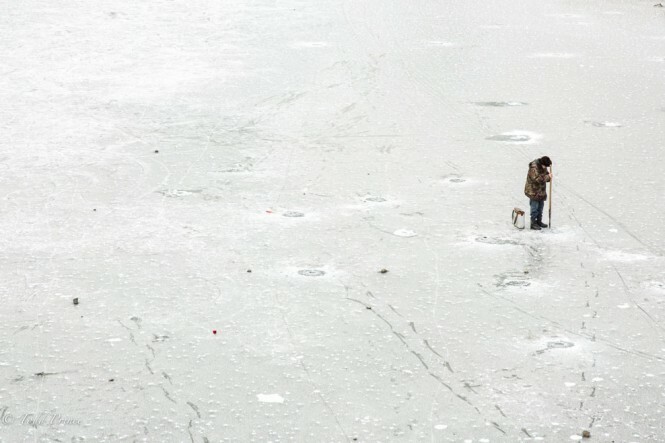 A man making a hole in the ice near Kolomna historic district in order to fish. The Moscow and Oka rivers meet in Kolomna and the nature along the rivers is pleasant for a long walk….or fishing, including ice fishing, as I discovered during my trip. 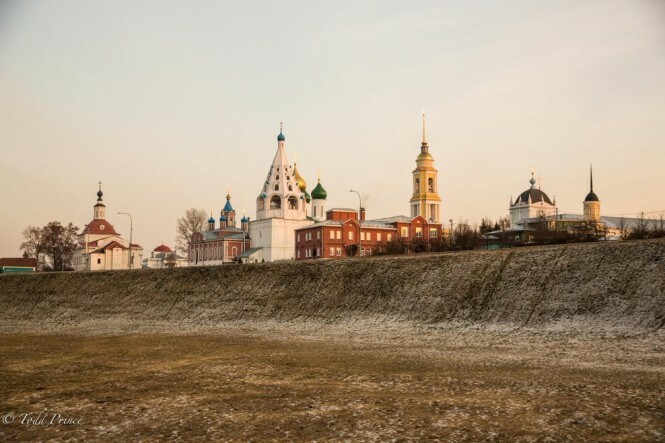 The combination of a well-kept historical area and picturesque natural setting make Kolomna one of my favorite Russian towns, second only to Suzdal. I had coffee and soup at the Namyoki cafe next to the Kremlin for about 400 rubles ($8) and then dinner including soup, chicken and tea for 700 rubles ($14) at Globus, a restaurant in the center of town with a Soviet atmosphere. Kolomna looks like an ideal place to photograph fairy-tale like Russia winter scenes, and thus I may head back for a weekend in the coming months. Below is a small selection of Kolomna photographs. You can see the full gallery here. 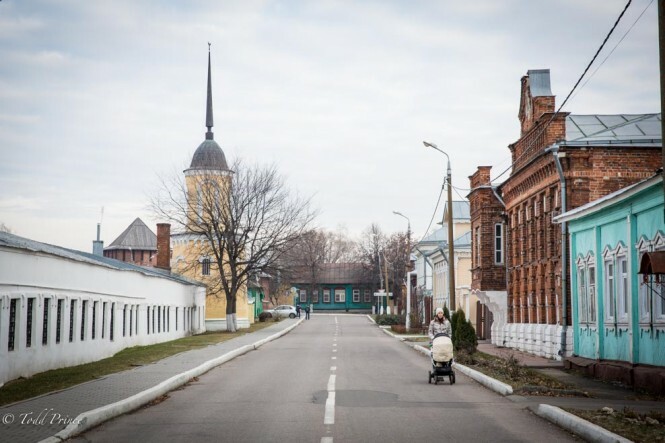 A woman walking her child along a quiet street in Kolomna’s historic district. 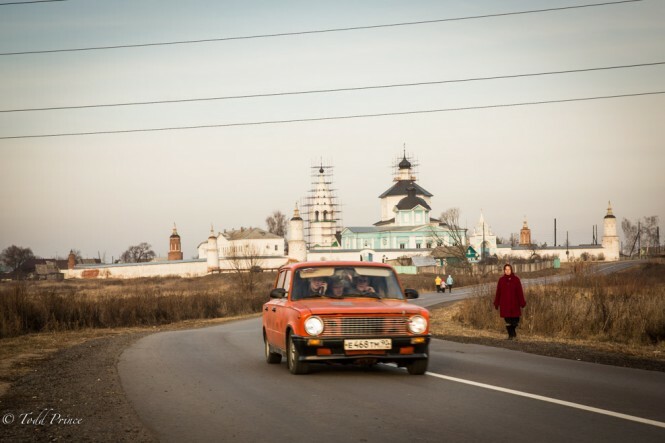 A Soviet-era car heading toward Kolomna. The Bobrenev Monastery stands in the background. 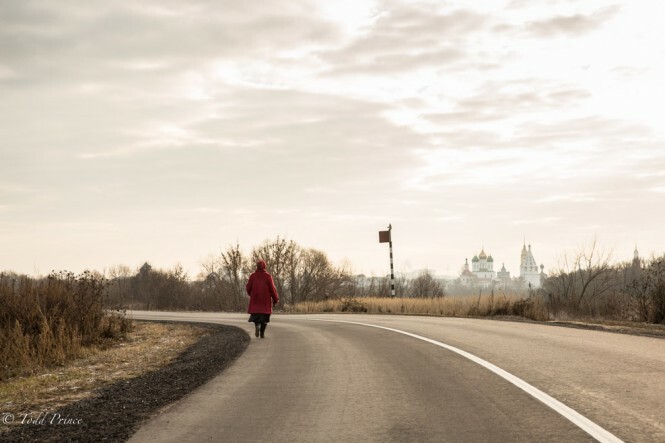 A woman in red walking back toward Kolomna from the Bobrenev Monastery. 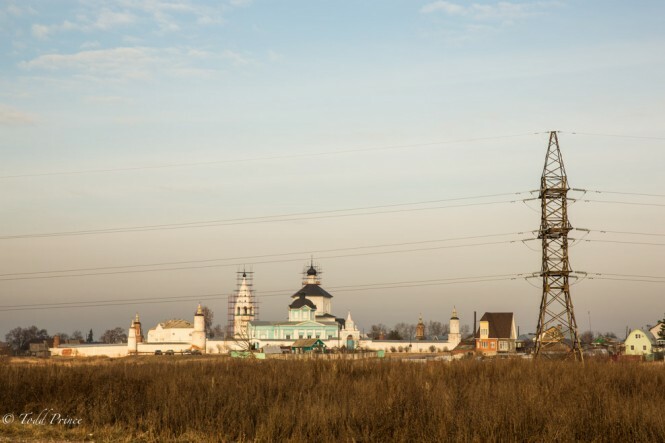 Kolomna’s churches can be seen in the distance. The long white wall of the Bobrenev Monastery. Kolomna’s historic district can be seen in the distance on the right. 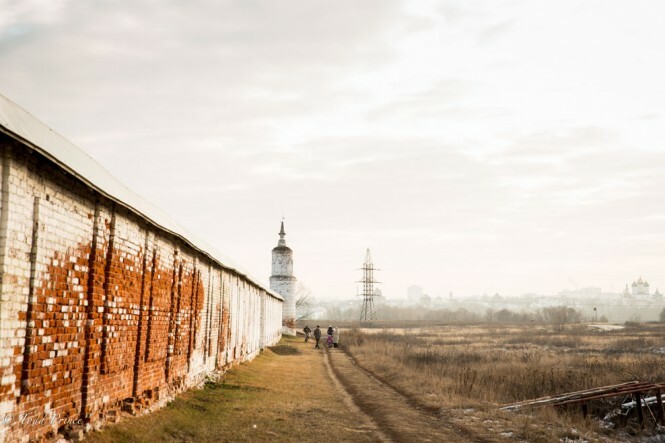 Two men walking toward the Bobrenev Monastery away from the historical part of Kolomna. People walk by the the Kolomna Kremlin wall at sunset. The Kolomna monastery and church cluster as seen from the northern side of the historical district.